Love the sweet image! and all those bubbles and ribbons! Perfect little charm added! Gorgeous layering and stitching! The scene created is so cool! Ready for a day at the beach! Sweet Tilda with a friend! Beautiful coloring and great layout to showcase the adorable image! Fabulous step card! Love the layer of ocean water! Pretty roses with the heart floral swirl diecut! Take a closer look at the image... cute little pearl bubbles! Congrats Ladies! Please stop by their blogs, leave them some love and see more of their gorgeous cards! Thanks to all our players last week, and there's still time to play along this week's challenge! Sweet card! Thanks for joining our CropStop Pearl Challenge. 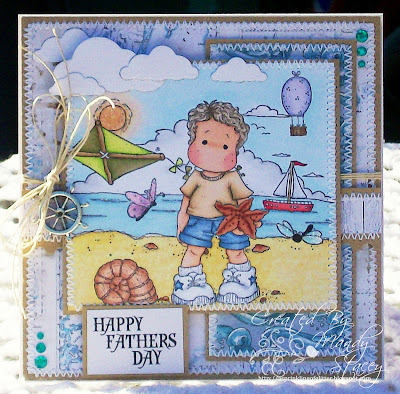 Thank you so much for choosing my card as one of your Featured Friday creations. I am very honored that you chose my "Make a Splash" card.